A height-adjustable front tiller and a “digital wig-wag throttle”. A length of 36” and a decent turning radius of 32.3”. The two front wheels are very close, acting more like a single wheel, making it respond more like a 3-wheeler. Does not come equipped with armrests, as standard, making it very unsafe for anyone with balance issues. A state-of-the-art, good-looking, foldable scooter, with a tight turning radius. But please do be aware of its drawbacks, especially the armrest issue. The EV Rider TranSport Scooter (S34-FD) exemplifies an exciting new generation of one-piece, foldable, lightweight, airline and car-trunk friendly, electric, lightweight, transport scooters which makes real independence possible. 1. With a suggested weight capacity of 250 lbs. it offers a top speed of 4 mph and a ground clearance of 2.4”. 3. A length of 36” and a decent turning radius of 32.3”, important in most elevators and tight spaces. 4. A height-adjustable front tiller and a “digital wig-wag throttle” which allows you to control the speed by pressing on the forward/backward levers on the tiller. One-handed operation is possible but I’d strongly advise using both hands! 5. The charger automatically converts from 110v to 220v which comes in very handy when traveling outside the US. 6. Without the batteries installed the EV Rider TranSport Scooter weighs 53 lbs., with the Lithium-ion batteries it weighs 60 lbs. and with the SLA batteries installed it weighs 70 lbs. 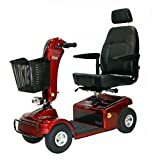 Although this scooter is lighter than most in this category it would still be heavy for an elderly or disabled person to lift. 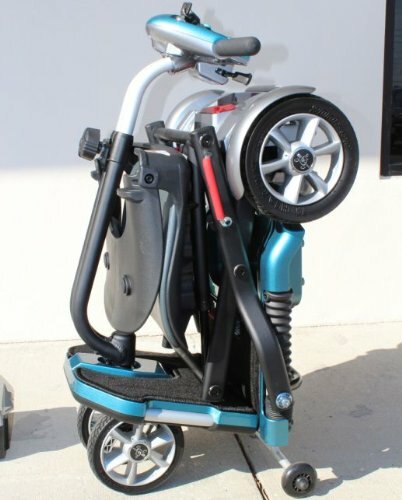 So, while it is a great folding scooter, one person would still have great difficulty lifting it in and out of the trunk of a car or SUV. Certainly not for someone with a weak back! 7. A removable key ensures that the ignition system cannot be activated without permission. The frame, platform and seat post come with a three-year (limited) warranty, the electronic components with a one-year (limited) warranty and the batteries are warranted for six months. The two front wheels are very close, acting more like a single wheel, which detracts from the stability of a 4-wheel scooter, making it respond more like a 3-wheeler, but the EV Rider TranSport does have four anti-tip, stability wheels, one on each side of the plattform and two at the rear which does make for greater security and safety. The 7” tires (front) and 8” tires (rear) are made of solid rubber which can make for a bumpy, jarring ride over uneven sidewalk or gravel. 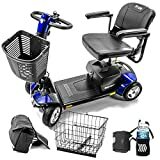 One major drawback with this scooter is that because of its foldability it does NOT COME EQUIPPED WITH ARMRESTS, as standard, making it very unsafe for anyone, (like me!) with balance issues. It is possible to have armrests added but they will nullify the foldability of the scooter, defeating the purpose of the unit. Also, because of the foldability, it is not possible to adjust or swivel the 16” wide seat, (seat height – cushion to floor – 20.5″), making it very hard for a tall person to get comfortable and raises the age-old problem of getting close to a table or bed. The EV Rider TranSport Scooter does not come with a shopping basket or pouch for storage of valuables nor does it come with a bag or a hard case for protection during airline travel. The EV Rider TranSport Scooter is a state-of-the-art, good-looking, foldable scooter, with its small size and tight turning radius making it perfect for tight spaces and for folding and unfolding while traveling. But please do be aware of its drawbacks, especially the armrest issue.